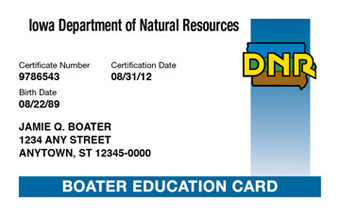 If your Iowa Watercraft Safety Certificate is lost or damaged, you can contact the Iowa DNR to get a replacement card. Simply call the DNR Customer Service line at 515-725-8200 for more information. Boating License or Watercraft Safety Certificate...is there a difference? The boater education card is proof that you have successfully completed a boating safety course. The boater education card does not expire and does not need to be renewed. Therefore, it is NOT an Iowa Boating License!